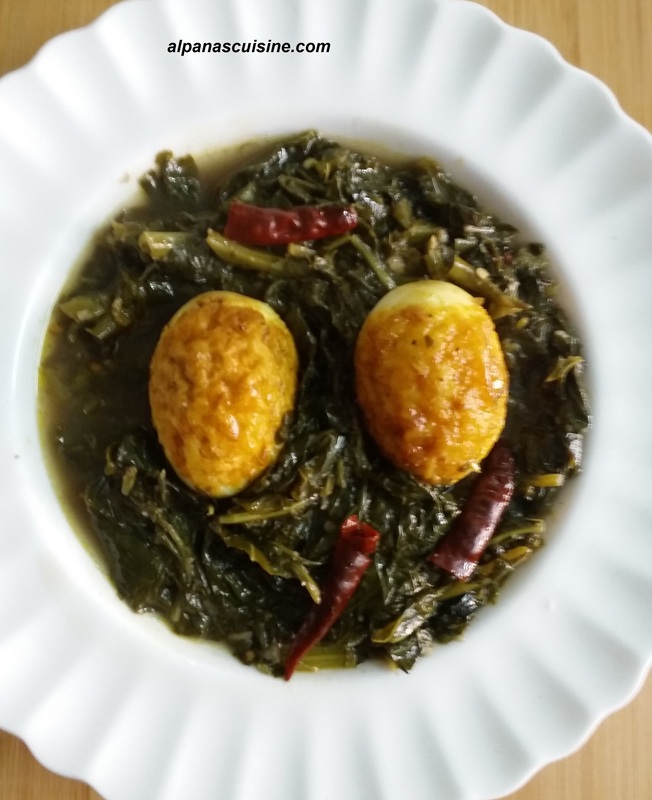 Haak T Thool is a Kashmiri dish cooked with collared greens and eggs together. It is most loved by the Kashmiri Pandits . The mustard oil and asafoetida are extensive used in Kashmiri cuisine. Haak which means ‘saag’ can be Spinach, Knol Khol greens etc. Hard boiled eggs are deep fried till golden and then cooked with saag . 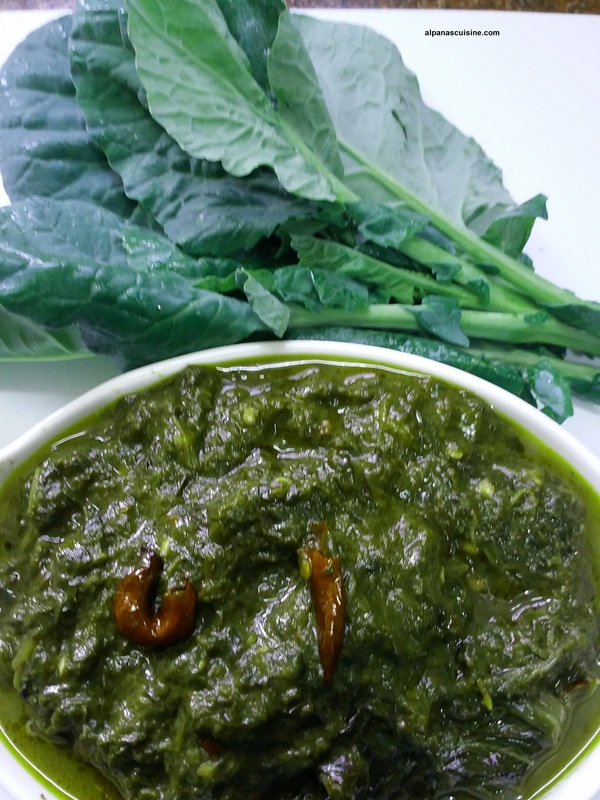 Here Monjji haak (kohlrabi greens/ Kashmiri spinach ) is used along with Egg. Deep fried Hard Boiled Eggs in Mustard Oil. Heat oil in a pressure cooker or heavy-bottom pan. Add Strong hing, Red chilies and Green challis with Garlic . Do not chop the leaves – use them whole. If using other greens such as collard or kohlrabi, remove any stalks that seem too coarse. When smoke starts from Oil add a pinch of soda (it will foam) and then put all Saag. Stir around till they wilt. Add water 2 cup (you may need more water for pan-cooking). Add salt Close the lid and pressure cook for 5-7 minutes (or simmer till tender: 15-20 minutes). Put the Fried Eggs on top of Haak . Serve with steamed rice and a bowl of plain yoghurt and Salad. Note:- The trick to retain the bright green of the leaves with the pressure cooking is to release the pressure immediately after turning the heat off. This can be achieved very safely by partially lifting the weight (prop with a wooden spoon), or by standing the pressure cooker briefly under a running tap.